Popular shop – Dress Agency ‘Penco’ closed a couple of weeks ago – many liked Corrine’s shop for the quality and vast variety of clothing, sorry to see it closed – personal circumstances. Corrine was a supporter of The Whittlesey Business Forum. The next meeting of The WBF will be on Wednesday 24th April – 6pm @ The Falcon Hotel. The weather this year was perfect – All Duck tickets sold out – Around 200 people in the audience. 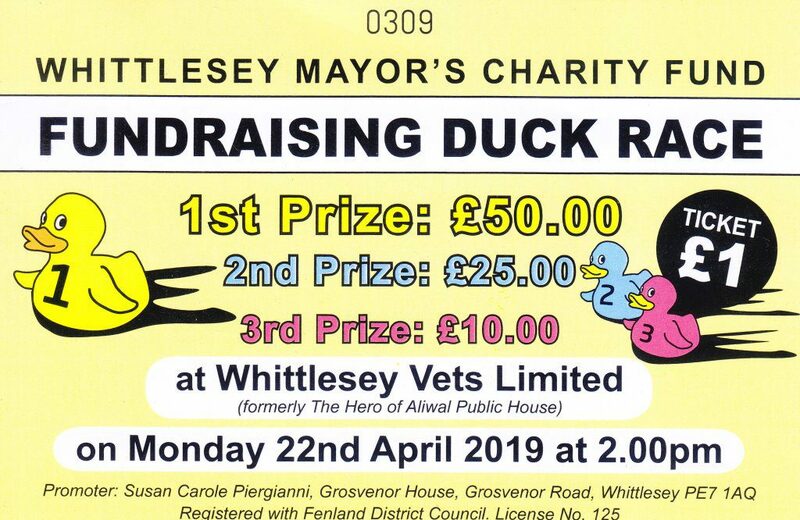 Website having a break for a few days…It is Easter and the weather is looking good, time to flash up the Barbie and open a bottle or two….there’s plenty going on locally, including the Mayor’s Duck Race this Monday 22nd @ 2pm – all proceeds to a good cause. I’ll be addressing the ladies literature (which I doubt very much she wrote herself) in more detail next week after the Easter break (lets all have a rest). It does make extremely interesting reading along with plenty of slight inaccuracies, along with what can only be described as a complete affront to democracy on how the Conservative Group makes its decisions (Not just making policies but making Decisions) at their Group meetings and NOT at the council chamber as it should be, ‘they’ have never before admitted to this before in writing at least, but this document proves otherwise, it will be coming next week never fear. I wonder who! the lucky person was this morning who made the 900,000th hit on my Web-Blog – as you maybe aware web-blogs takes time, effort and commitment to keep up-to-date with news, facts and events. Thanks to ALL my loyal readers…. I wonder when ‘We’ shall reach the magic Million Mark. 3 days since I posted up for Connie – This year’s – Walk to Remember® on behalf of the Sue Ryder Foundation ™@ Thorpe Hall Peterborough – taking place on 19th May. I am happy to announce that Connie has raised so far £90:00 on her ‘Just Giving Page’ and has been out this morning and increased to £95:00 in cash donations = £185:00 well over the ½ way target. 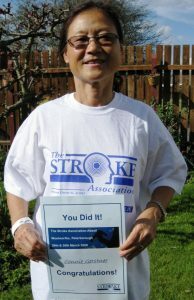 Connie is very well aware of the fantastic work the Sue Ryder Foundation carry out, Connie was the Ward Manager/Senior Sister of the Stroke Unit at Peterborough District Hospital/Edith Cavell Campus for over 25 years before she retired. She is very humbled by dozens of people who often stop and talk to her about still being ‘here’ thanks to the team on the Stroke Unit. Connie does a couple of sponsored walks a year, but this is the main one she is doing this year….Why not help by donating a small amount – ‘Every little helps’ as they say. The picture on the left was when she did a ‘sponsored abseil down the side of the ‘Old Woolworth’ building in Peterborough a few years ago. You can go directly to Connie’s Just Giving Page by clicking on the button below…. At this months meeting of the PPG (Patients Participation Group) – I asked how many patients had left the NQS since last September. Today I have received the following statistics, please note when a patient leaves it maybe for various reasons perhaps moving away for example, so patients moving because they may not like the ‘new’ telephone triage booking system will not flag up. Many articles in the national press report that by the end of 2020 the majority of surgeries will be using systems similar the NQS. One of Low Life favourite dumping places is near Decoy Lakes near Eastrea. 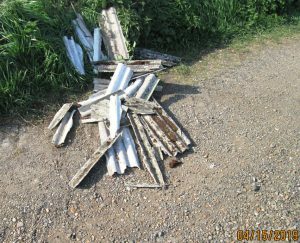 Many occasions of fly-tipping has been found. FDC’s rapid response team are very good, however ‘asbestos’ takes careful handling and disposal and there is the cost of course. If you see any fly-tipping you can report it via FDC’s phone number 01354 654321 or on-line at FDC’s website.